Square Enix announced that Dragon Quest XI will be launched in Japan on July 29th for PlayStation 4 and Nintendo 3DS. The game is still planned to release on the Nintendo Switch as well, but the company didn’t confirm whether it would happen at a later date. Dragon Quest XI on PlayStation 4 will be powered by Unreal Engine 4, while the Nintendo 3DS version will have a different style with 3D graphics displayed on the top screen and 16-bit styled sprites on the bottom screen. However, players will have to eventually choose a style (though they can then switch it up at any time). Our previous report also details some additional differences between the two versions of the game, though both will have the series’ trademark turn-based battle system. The two versions of the game, however, will come with some differences: the PlayStation 4 release will use a Free Movement Battle system where players can freely move the character and camera, with an Auto Camera system allowing players to just focus on the battle; the 3DS version, on the other hand, will feature a 2D mode with pixel characters and a 3D mode, which looks not too different from the 3DS remakes of Dragon Quest VII and Dragon Quest VIII. 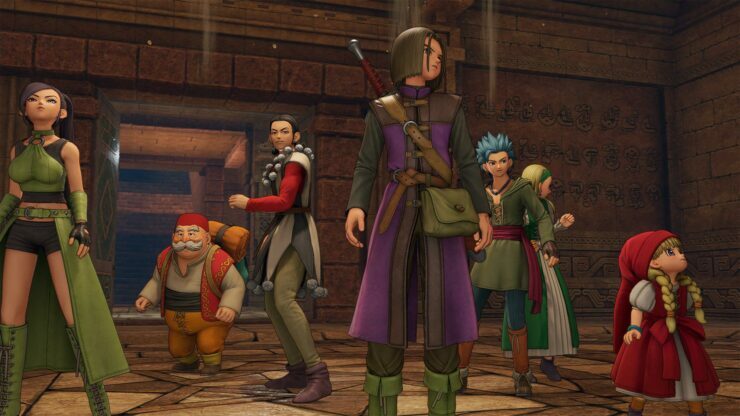 Dragon Quest XI looks like it will introduce several new features which promise to spice up the series classic experience in several ways, such as the ability to ride dragons on the field and more. Other features from recent entries, such as crafting, will also be making a comeback. Dragon Quest XI‘s story will take around 50 hours to complete. When considering the sizable side content, the game should easily last more than 100 hours. If you have a Dragon Quest itch to scratch, the action-based spin-off Dragon Quest Heroes II is set to launch later this month for PlayStation 4 and PC.